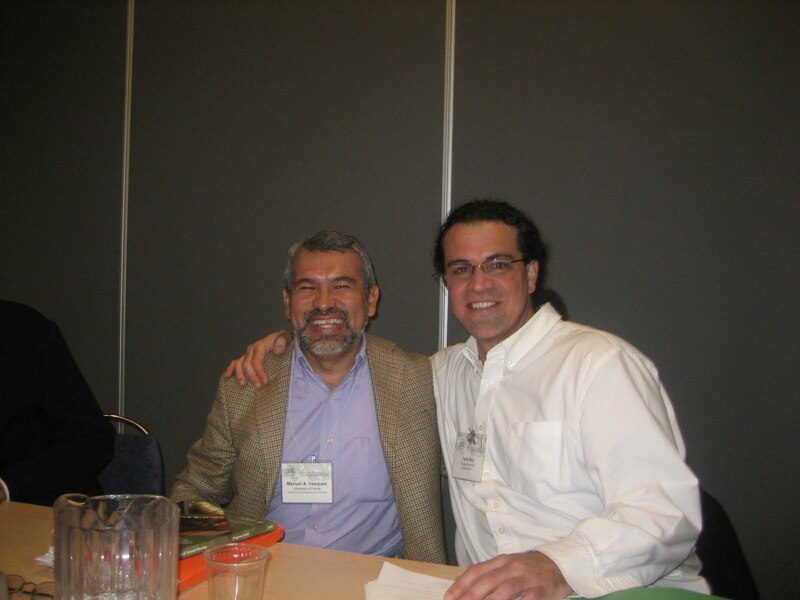 Manuel Vazquez, Associate Professor of Religion at the University of Florida (Vazquez is on the left of this picture and Terry Rey, Professor of Religion at Temple University, is on the right), called my book a good example of post-functionalist sociology of religion. Functionalism enters into sociology of religion when scholars talks about religion in terms of what religion does for people in terms of “cash value.” Vasquez commended that although I don’t ignore that religion does things for Haitian immigrants, including connecting them to social networks and social services, I also talk extensively about hope, resilience, and generosity—or the substantive and meaning-making side of religion. In other words, he said I talk about what religion does for people while also talking about what religion means for people. Furthermore, he liked how I embed Haitians’ religious faith within specific institutions without falling into functionalism. He called my use of multiple levels of analysis a non-reductive type of materialism. He cautioned me not to over-generalize the three models of church-state cooperation that I describe. In the U.S., he thinks there may be more conflict between immigrants and the state than I acknowledge in my book. In response, I think that as Milton Gordon said about earlier immigrants to the U.S., American society did not become a melting pot without conflict. Gordon said, and I agree, that what is interesting about the U.S. is that despite some conflict, over time most immigrants and their descendants joined the American middle class mainstream. Similarly, when Haitians first began settling in Miami, there was some conflict with the state. But through the advocacy of Father Wenski and others Catholic Church leaders, the state slowly began to cooperate more with Haitian institutions. Using the term “cooperation” to describe the U.S. model of interacting with immigrant organizations, including faith-based ones, does not mean that conflict is totally absent. Rather, over time in the U.S. and when compared to France and Quebec, the U.S. is remarkably adaptable to new immigrants and new religious groups.